Three Warriors was created by 10 year beauty industry veteran, Corbin Halliday. In 2015, falling physically unwell, Corbin made the conscious decision to care for his body using organic and toxic-free beauty alternatives. 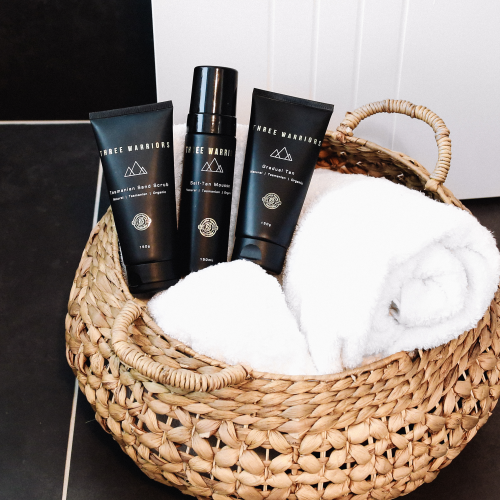 We interviewed the CEO of Three Warriors Tans to find out more about the beautiful philosophy and technology behind Three Warriors products. Corbin, what is the backstory behind Three Warriors? Thus the Three Warriors product range was born. The idea behind this was to promote healthy nourishing care for your skin, through a passion to give back and promote positive change in the beauty industry. How did you formulate Three Warriors tan to be so long lasting? We all know oils are fantastic on the skin, nourishing and hydrating. I sourced Tasmania’s only certified organic Oil Olive from a spectacular place called Flinders Island. The Olive Oil is a key ingredient to prolong the tan and stop the skin from drying out! How did you develop the scent of Three Warriors Tan? We all hate the nasty smell of tanning products. Lime and Vanilla are my favourite fragrances, so I figured why not put these in my products! Such a subtle but fresh scent on the skin. What was the process behind finding a tan colour to match any skin tone? This is all about pigments, everyone's skin tones are different, it a bit like hair when you colour someone's hair blonde you will need to tone it down to a natural colour and get rid of any warmth. Skin is similar, I added a purple plant derived violet colour which leaves an incredible natural tone on all skin types. Why should you choose Three Warriors over other spray tans and what sets you apart from the rest? Ione Oxide is a very toxic ingredient along with other nasty artificial pigments that are in all tanning products that are certified organic and toxic-free. These ingredients are basically full of heavy metals which you are putting straight into your bloodstream. Three Warriors stands out from the rest by the scent, long-lasting colour, the hydration and the natural, organic and toxic-free ingredients.